Few days back we had reported about Redsn0w 0.9.5 Beta 5 for Windows release to jailbreak iPhone 3G iOS 4.0 & iPod Touch 2G 4.0. The same Redsn0w 0.9.5 Beta 5 for Windows & Mac has been updated and comes with many new options now. The latest Redsn0w 0.9.5 beta lets you individually select whether multitasking and homescreen wallpaper are enabled previously this option was combined. 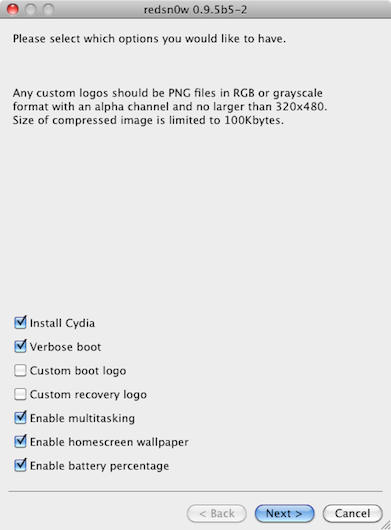 It also adds battery percentage, custom boot logo, custom recovery logo and verbose boot mode options. (Verbose boot shows you the kernel messages during boot). Download Redsn0w 0.9.5 Beta 5 for Mac OS X. Note: Once you enable battery percentage, you actually toggle it off and on via Settings->Genera->Usage. LINK FOR WINDOWS DOWNLOAD IS F$CKING DEAD!!! please fix the windows link… thanks. The link for the Mac version of RedSn0w 0.9.5. doesn’t work. Where can I get the update that runs on a mac. Other sites that I have tried have said that it is the Mac version but it doesn’t work when I run it. I downloaded it for Windows but it just takes me to an “Evaluation Copy” I’m not the best with computers so i’ve not a clue what this means. Help? We are sorry, but this site has exceeded its bandwidth limit at this time. Please try again later. For more information, see Google Sites help.